Open registration for the Mid-Atlantic Mod has begun! Join us, the the Central NJ MQG and the DC MGQ for a weekend of quilting and fun. Details are below. 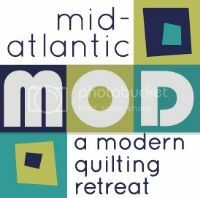 Mid-Atlantic Mod: a modern quilting retreat is a modern quilting and sewing retreat organized by the Philadelphia MQG, the DC MQG, and the Central Jersey MQG. The purpose of the retreat is primarily to bring modern quilting and sewing enthusiasts together for a weekend of sewing and socializing. The retreat will include some (optional) workshops and activities, but will focus on open sewing time. Location: Doubletree by Hilton in Lancaster, PA. Please click on the Location link at the top for more details. Lodging: Room rate is $129 per night for single or double occupancy. Reservations should be made on your own (details will be provided once you complete the registration form). For attendees who do not reserve a room in the group block, an additional $35 fee will be required for registration. UPDATE: We can no longer accept registrations for people who do not wish to stay at the hotel due to our room block requirements. If you complete the registration form and indicate that you will not be staying at the hotel, then we will put you on a wait list. Food: Food catered by the hotel is very pricey, so we have opted to NOT include food in the costs. There is a restaurant in the hotel and numerous other restaurants nearby. Please see the Location link at the top for more info about the area. Workshops: Not everyone wants to take workshops, so to make the event more affordable for all, we have NOT included workshop fees in the registration cost. We are looking into adding workshops if there is enough interest and these workshops will be offered a la carte for an additional fee. More details will be posted to the News page above when available. Activities: We are contemplating various activities including: shop hop, virtual shop hop, progressive quilt, inter-guild swap, and others. Please check the Activities page for details. We will update this page as we add activities. Sponsors: If you are interested in becoming a sponsor, please contact us by clicking here. We have a variety of options for sponsorship. All sponsors will have the opportunity to provide a logo that will be displayed prominently on this website (with a link to the company website, if provided) and in the welcome materials provided to all attendees. Please use the Contact Us link if you have any further questions. Riley Blake Challenge + A Giveaway!